Can You Paint Your Kitchen Countertops? Kitchen Cabinets and Granite Countertops, Pompano Beach FL > Blog > Blog > Can You Paint Your Kitchen Countertops? Tired of your kitchen countertops but unsure if you can afford to replace them just yet? You can affordably change the look of your kitchen by painting your countertops. Painting your countertops can grant you a similar look to your favorite high-end kitchens. 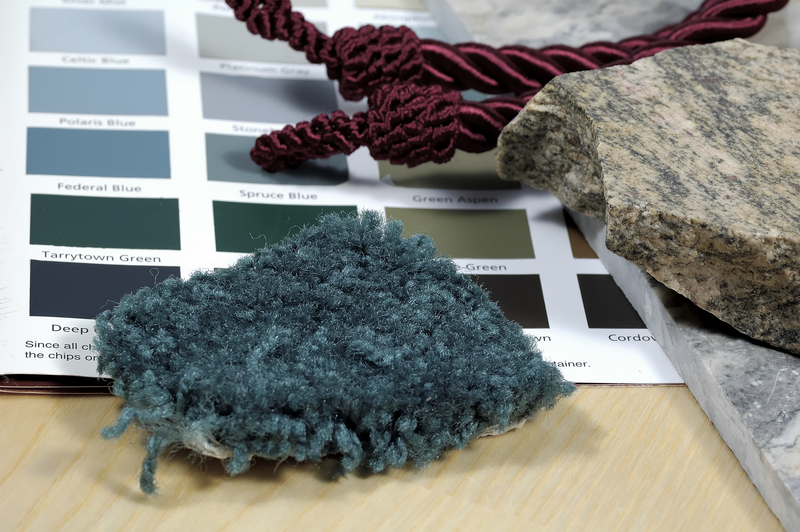 Countertop paints come in many different colors, from solid shades to hues that imitate granite. Most countertop paints work on select surfaces including, ceramic tile, wood, solid-surface, laminate or cultured-marble materials. When done right, painting kitchen countertops makes a big impact and looks really nice. Still, it’s usually somewhat obvious when countertops are painted, which is why installing new countertops is often recommended. You might be surprised at the deals you can score on real granite countertops when you purchase wholesale. -Countertops get a lot of wear and tear and painting your countertops doesn’t offer much durability. In most cases, it won’t take long before you start to notice nicks and other flaws in painted countertops. -Painting countertops can make your kitchen look better, but won’t step your kitchen up to its full potential. -Painted countertops are more likely to stain so be careful what you set out directly on them. -If countertops are badly damaged even paint is going to struggle to cover it up. How old are your existing countertops, and perhaps more importantly how much wear and tear do they currently show? If your countertops still have a lot of life left to offer it might make sense to paint them instead of replace. On the other hand if your countertops are in bad shape they might not improve too much, even with hefty coats of paint. Painting is more affordable than replacing, but painting countertops is not always as cheap as people assume. Melamine countertop paints are far from cheap, plus you will need to purchase trisodium phosphate to prep and clean your countertop surfaces. You will also need to purchase primer, topcoat and sandpaper. 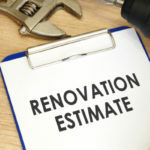 Once you add up the costs and the time it takes to paint countertops it becomes an investment you need to be sure about. Once you start, there’s really no turning back. 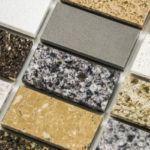 Get estimates on all options, including wholesale countertops, before diving into the project. 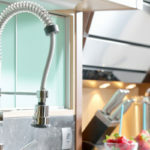 There are clearly benefits to saving up and buying new countertops, but that doesn’t mean painting your countertops is a bad idea. Here is a brief overview explaining how to paint your countertops using Giani granite-look alike paint. This type of countertop paint is usually around $70 per can, and each can offers enough paint to cover 35 square feet of surface area. You want to deep clean your countertops before applying any paint. Remove all grease, and dirt using a scouring pad. Make sure to clean, rinse well with water and repeat several times. 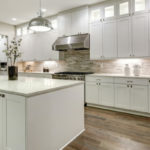 If your countertops are damaged you will need to fill in the cracks or holes with an appropriate filler and then sand using a 600-grit sandpaper. You will then use a primer to coat the countertops, many countertop paints come with the appropriate primer for you to use. The primer will need to set and dry for at least 8 hours. Once the primer has dried, it’s time to make your countertops look like granite. You will use a sponge to blot the mineral colors included in the Giani set all over your countertop surface. The sponge is important because you want to blot the colors onto the surface as opposed to smearing them. It is highly recommended you try it out first on construction paper to get a feel for how to make the mineral colors appear natural. You want to avoid a streaky look and instead produce a more seamless interaction of mineral colors. The mineral color layer needs to dry for at least 4 hours. After the layer of mineral color dries you will give the surface a gentle sanding. The final step in the process is to apply the topcoat. The topcoat requires 4 hours to dry. Wait at least 7-8 hours before you set anything on your countertops, such as a coffee machine or toaster. For the next two weeks you will keep countertops dry and use with caution in order to let the paint completely cure and settle. Tops Kitchen Cabinet offers beautiful granite countertops at wholesale prices you can afford. Contact us today to learn more!